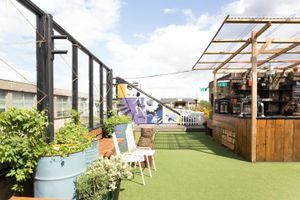 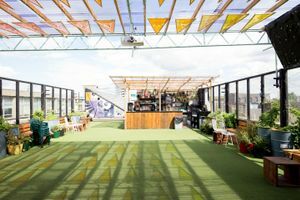 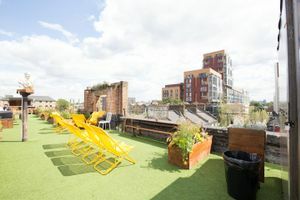 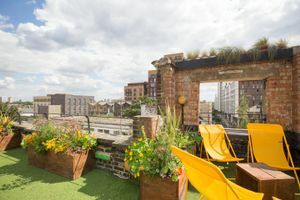 Situated just a short walk away from Dalston Junction underground station, this outdoor rooftop space is available to rent for a pop-up, gallery or event. 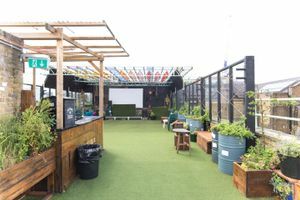 The ground is coated a comfortable layer of artificial grass and the space is bordered by a attractive mix of black metal railings and large glass panels. 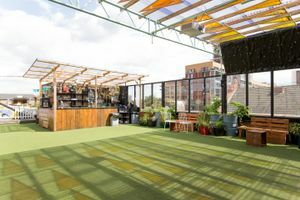 These panels lead on to the sheltered end of the space, which is supported by a brick wall and black woodwork. 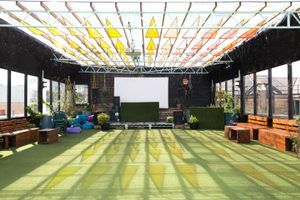 Above this area are striking masts of colourful stained glass which beautifully reflect onto the green 'grass' below. 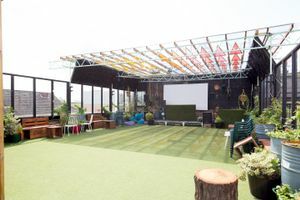 There is also a blue railing that sits above the sheltered area which is compatible with a projector.